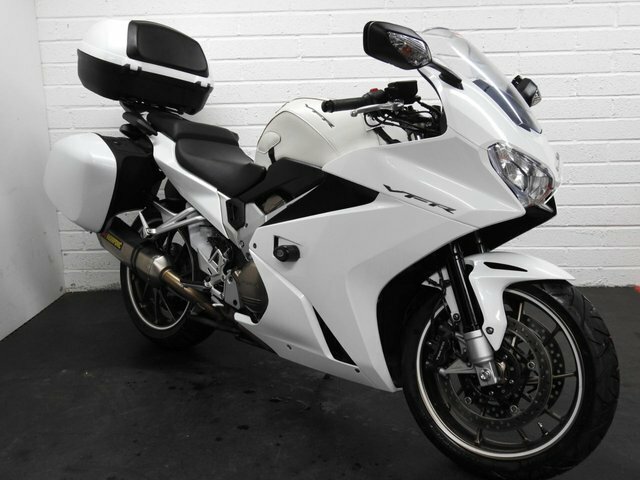 Immaculate Honda VFR 800 F, Hich spec bike with ABS brakes, Traction Control, Honda Heated grips, LED Lights, FULL HONDA LUGGAGE!, Akrapovic Exhaust, Crash Bungs, Leather Tank guard, Head light Protectors, Honda Colour coded Rear seat cowl! Only 11800 miles, 1 owner from new! Faultless bike! this bike will come fully serviced with a full 1 year MOT! To arrange a viewing or to discuss your purchase options further please phone us on 01344 887007. We have very competitive rates of FINANCE should you wish to spread the cost? we also offer nationwide delivery, accept cards, and offer extended warranty! FINANCE SPECIALISTS / PART EXCHANGE WELCOME / WARRANTY AVAILABLE / CREDIT AND DEBIT CARDS ACCEPTED / DELIVERY POSSIBLE. To arrange a viewing or to discuss your options further, please feel free to contact us on 01344 887 007 or 07506 105 058 Rideworx specialise in motorcycle sales and finance. We also offer full workshop and diagnostic facilities for all your service needs.